Customers often ask us “when is the right time to open our pool?” Early spring is the perfect time to begin balancing your pool water as it will prevent algae from forming when the warmer weather arrives. 1. Clean up all plant debris around the pool from your patio, deck, trees, and plant beds. Remove any water that’s accumulated on your pool cover all winter with a shop vacuum or pump before taking off your cover. This will ensure the collected water doesn’t dump into your pool. Inspect your pool inside and out for any damage, this includes checking the filter and pump parts for possible replacement, nicks in the deck and coping to be repaired, and calcium scale and other tile stains to remove. Keep in mind that different kinds of pools may have different wear and tear. 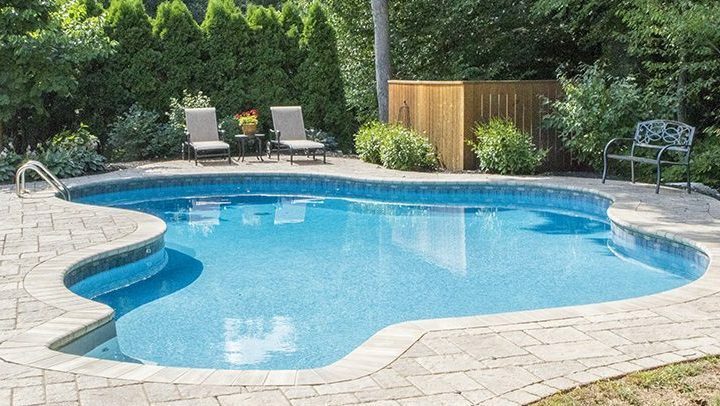 Vinyl liner pools can have holes and tears, gunite pools can have cracks and water loss, and fiberglass pools can have large cracks needing repair. Clean, repair or replace your pool, deck and patio furniture to make sure it’s safe to use. This includes checking ladders, diving boards, slides, rails and rescue equipment. Be sure that emergency numbers are posted by the pool. Accidents do happen! Check pool chemical container expiration dates and replace if necessary. Be sure to dispose properly of any cleaning supplies that are expired or were not properly sealed in the off-season. If you use a pool opening professional, their service should include the removal of the winter cover and winterization plugs, adding start-up pool chemicals, reassembling and starting up your pool filtration equipment for the season, putting in ladders, diving boards, lights and more. We highly recommend using a pool service professional for any pool maintenance. Call us to ask about our professional pool opening services at 610-845-2221.